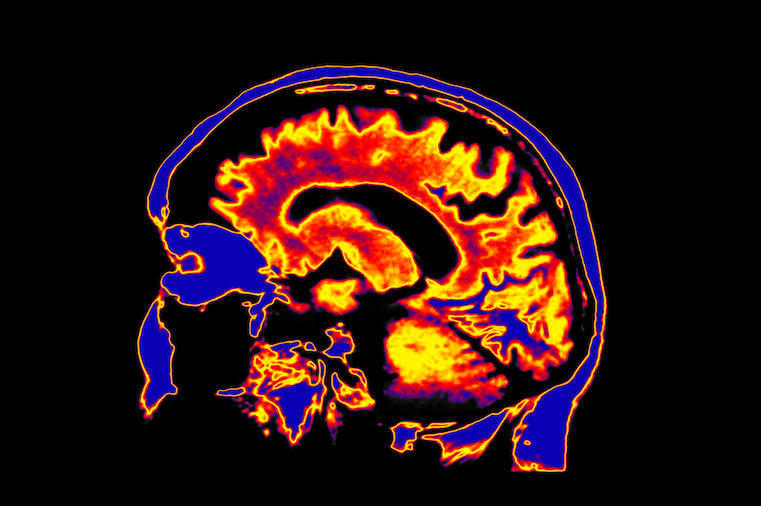 Hubspot - What Can a Brain Scan Tell Us About Stress and Technology? What Can a Brain Scan Tell Us About Stress and Technology? Originally published Feb 14, 2019, 7:00:00 AM, updated February 14, 2019, by Amanda Zantal-Wiener (@amanda_zw). My brain has been called many things over the years -- from a "gold mine," to a "minefield," to, most recently, a "hamster wheel." That was the term assigned to it at CES 2019, a major annual consumer electronics events after I received a brain scan while sampling a product called TouchPoints. TouchPoints are small wearable devices that release micro-vibrations that, when worn by users, can trigger a nervous system response that has shown, in some cases, to lower stress levels. That's where the brain scan comes in -- at CES, the team behind TouchPoints used it to show what a user's brain activity looked like before and after using the devices. But how, exactly, does it work -- and what does it say about the broader concept of stress, as well as where it intersects with technology? Here's what happened when I underwent my own brain scan, and what I learned about that very question. TouchPoints fall under the category of wearables: a type of technology that seeks to shrink down intelligent electronic devices -- e.g., smart watches -- to an accessory or item of clothing that can be worn by its users. In 2019, wearables are predicted to see a 9% increase in sales, leading them to draw high levels of attention among consumers and industry analysts alike. The specific wearable technology behind TouchPoints are the vibrations they emit -- formally known as bilateral alternating stimulation tactile, or BLAST. According to research conducted by Dr. Amy Serin -- a neuropsychologist and the founder of the Serin Centers for psychology, who helped administer the brain scans -- exposure to BLAST vibration has correlated with changes in brain activity that indicate a deescalated stress response. These include modifications to the user's overall calmness, as well as physical symptoms that often result from stress, like stomach pain or muscle tension. So, how can a brain scan measure the effectiveness of a wearable device like TouchPoints? Well, the scan -- formally known in this case as a quantitative electroencephalogram -- is used to measure beta activity in the brain. When such brain activity is elevated, Dr. Serin explains, it can be an indicator of stress. "Excess beta activity is associated with anxiety and obsessive thinking," says Dr. Serin. And if a scan shows decreased beta activity, it's "associated with clearer thinking and calm focus." As a self-admitted over-thinker, I wasn't sure just how effective a wearable device would really be in addressing what is, for me, a typical baseline of high stress. If daily meditation and mindful breathing practices weren't enough, how could wearables -- which have faced a degree controversy -- so easily fix the problem? But when a neuropsychologist invites you to try a product that could potentially lower your anxiety in 30 seconds -- and pair it with a personal brain scan -- you say, "Yes." Following the 45-minute process of being fitted for a brain-wave-reading cap, being asked to think of something stressful, and then being fitted with the TouchPoints (see the video at the end of this post), my results were in and displayed on a large screen. "That's your hamster wheel," said Dominic Di Loreto MA, BCN Director of Applied Neuroscience at the Serin Center, pointing to the image on the left: the "before TouchPoints" image of my brain activity. The image on the right, meanwhile, displays my brain activity after wearing the TouchPoints for a few minutes. I stood, dumbfounded, starting at my scan results. "That's incredible," I said, after muttering some disbelief-inspired expletives. As for my own scan results, "The image on the left shows the excess beta activity in your brain before TouchPoints. Excess beta activity is associated with anxiety and obsessive thinking," she explains. "During TouchPoints use, your beta activity lowered significantly as shown on the right. This is associated with clearer thinking and calm focus." It's an intriguing intersection -- that a phenomenon that's been shown to increase stress levels (technology) is actually being built at a rate higher than ever to counter these symptoms, and to improve overall mental and physical health. The entire concept started, arguably, with mobile apps designed for mindfulness. Now, the technology can be worn by the user directly. I had a chance to speak with Dr. Serin before, during, and after the brain scan process -- and about what devices like wearables say about the current state of stress in the modern era. Data collected by Dr. Serin and her team, for instance, "show that it is unfortunately very common for people to be in stressful states way too often. But using TouchPoints can bring a profound sense of calm without the user having to shift what they are doing." Stress is on the rise globally. Our bodies are not meant to live with artificial light, screen time instead of real interaction, chronic sleep problems, et cetera. The result is more excess stress. And worse, the common 'stress management' techniques add more to your day or are inefficient. Dr. Serin pointed to the convenience factor of a wearable device like TouchPoints: something that can be easily put on by the user and reduces stress without taking a significant "break" in the day. "That's what people need now more than ever," she says. "Instant stress relief without adding another 'to-do' to an already packed schedule." But others in the field of psychology have questions about the idea of a quick fix -- and understandably so. While my own scan showed evidence of decreased activity associated with stress, it was done so with the guidance of professionals who reminded me to unclench my jaw and try to relax once I had the TouchPoints on. "I think it’s great that we are using our powers of technology to improve ways to treat mental health issues," says Dr. Laurie Paul, a psychologist in the Washington, DC area. "My main concern, though, is when the general public interprets things like this [e.g, brain scan results], they may misinterpret it because they haven’t had the proper training that a neuropsychology professional would have." And while these concerns are valid, it doesn't completely negate the positive benefits of wearable devices like TouchPoints. It's possible that one might experience the best results with the guidance of an expert, or perhaps in tandem with other stress-reducing activities, like meditation or mindfulness practice. The bottom line: To see founders and experts within the tech industry develop devices to encourage wellness is an overall positive development and one that my hamster-wheel-brain and I find encouraging. While the category of wearables is still in a fairly early stage, the emergence of products like TouchPoints from it is a positive sign that, as it evolves, solutions can continue to become more accurate and personalized. 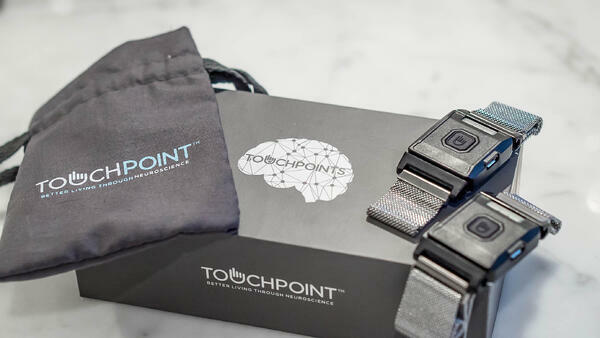 But without further ado -- here's a closer look at the TouchPoints experience. This article first appeared in Hubspot on February 14, 2019, by Amanda Zantal-Wiener. To read the full article, click here.